Eucalyptus Essential Oil - 30 ml. Offers expectorant and decongestant benefits to assist clear breathing and support respiratory comfort; also helps soothe sore, tired muscles. Rosemary Essential Oil- 30 ml. Known for stimulating, clarifying and cleansing properties. May support healthy digestion and respiratory comfort, enhance memory, help calm nervous tension and fatigue and soothe muscle aches. Tea Tree Essential Oil - 30 ml. May offer antiseptic protection for wounds, inhibit fungal growth, soothe skin irritations, stimulate immunity and promote relaxation. Lavender Essential Oil - 30 ml. Features calming, relaxing properties to soothe nerves and stress, support restful sleep, help soothe skin irritation and ease muscle tension. Lemon Essential Oil - 30 ml. Features refreshing, cleansing and tonifying properties. May aid digestion and respiratory comfort, support cognitive energy and focus. Cleans and degreases home surfaces, freshens laundry and purifies the air. Peppermint Essential Oil - 30 ml. 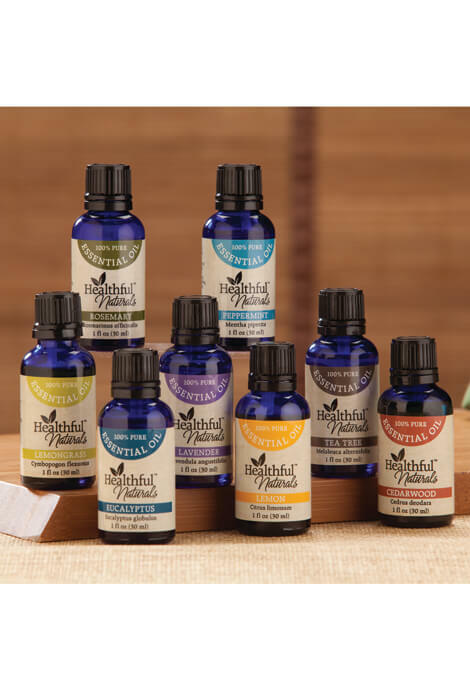 Features calming effects known to soothe digestive issues, enhance mental focus, promote respiratory function, help relax tense muscles, offer analgesic effects and ease sensitivity to headaches. Cedarwood Essential Oil - 30 ml. With its warm, woody aroma and calming, cleansing, harmonizing properties, it can be used to keep moths away and promote relaxation while soothing mind and body. Lemongrass Essential Oil - 30 ml. Beyond its citrus herbaceous aroma which can heighten awareness, it boasts cleansing, antiviral, and antimicrobial properties, and is a safe, natural solution for repelling insects. Lemongrass also helps encourage healthy digestion, is an ideal choice for massage therapy and provides purifying and toning benefits to skin.